The Wisconsin lake town of 16,004 was wrestling with a major civic improvement – a rebuild of their beloved but dilapidated shoreline boardwalk on neighboring Lake Fowler. Kimmes represented the engineering firm the city council selected to oversee the boardwalk rebuild. A critical moment had arrived: Should local taxpayers dig deeper into their wallets to fund not only lighted handrails for the 300-foot long boardwalk but also lights for the bottom rail as well? Snap-on the lights for the dual-lighted railing sample Feeney sales estimator John Arisman had made and shipped to Kimmes in anticipation of the meeting. As expected, the illuminated cable rail sample performed its magic. Impressed by the glowing sample, the council voted to approve the extra expenditure. That was one of several hurdles Kimmes’ design and engineering firm, Stantec, was asked to clear in what became “… the coolest project I’ve worked on” in a 20-year municipal engineering career. 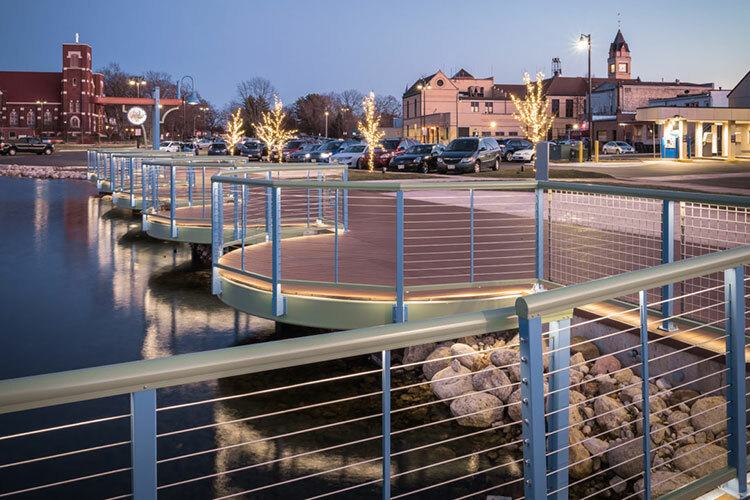 Today the glittering, festive Lake Fowler boardwalk is the de facto face of the Wisconsin community, a major business development engine for merchants because “… the pedestrian traffic the boardwalk generates is immense,” according to Kimmes. The Maintenance Issue. Years earlier, the Oconomowoc Community Center was constructed with a cable rail in-fill system. Unfortunately, the town installed a mismatched steel and aluminum system. The corrosive clash of dissimilar metals forces the city to repaint the steel posts every couple of years. “We knew Feeney had the right connection and materials between post and cable rails,” says Kimmes. The Spill Issue. What happens when a visitor places a drink on a top rail? Isn’t there a danger the drink will spill into the lake? “We liked Feeney’s choice of top rails. We actually chose the DesignRail® Elliptical Top Rail to help prevent folks from placing food and drinks on top of it,” Kimmes says. The boardwalk formally opened to the public in late 2017. Informally, it opened much earlier. Residents just couldn’t stay away. “A ribbon-cutting ceremony seemed awkward because so many people were already using it!” Kimmes laughs.